So I have talked about gaming on this blog a few times now and I have been talking about the boyfriend on here since the beginning. I never formally introduced him to the blog, although I've talked about him so many times. I figured that I would introduce him today, but mostly in the aspect of him as a gamer so you can get a feel for the type of gamer he is. & if you or your significant other play any of the games he plays too, comment or email me your gamertag so that he can connect with you/them! My name is Darell. I'm 22, and I've been gaming since I was 5 or 6. I play a lot of games; back in high school I was really into Call of Duty/Halo I was an avid FPS player. (first person shooter). Now I play mostly strategy games like League of Legends. I do however play other genres which aren't as mainstream as others. I love city builder games like Cities: Skyline, episodic adventure games like Telltale Games/Life is Strange, and other tycoon games like Prison Architect/Roller Coaster Tycoon (I used to fight with my mom over playing RCT, we both would hog one computer back in the early 2000s). As far as getting how I got into video games, I don't know if "got into" is the right question to ask, video games felt like they were always there in my life. My dad bought me a Nintendo 64 when I was a kid, and my cousin bought me Starcraft Broodwar for the PC on my 7th birthday, so those were simple steps that brought me to where I'm at. I always remember hanging out with cousins and playing games, whether it was Super Mario World on the SNES or Super Smash Bros on the N64 as time moved on. During family parties once all of us kids were tired from playing hide-n-seek/tag (1990's) or when we it would get too cold outside we would all huddle inside a room and play games. There were usually around 8 of us rotating 4 controllers. We were always competitive, which still translates to how we play games today. Of course, every gamer has their favorite games that they love and usually don't ever get tired of playing. This is a hard one for me as there are SOOO many games out there; it's like naming the best films. It sounds crazy and unconventional, but landing a job in the gaming industry is definitely a goal I'd love to achieve. They say if you have a job you love, then you never work a day in your life again. I am not sure what I would want to do; different companies excel in different things. I would love to work along the lines of eSports videography/photography whether that means I'll be camera operator, event photographer, live interviewer, something along the likes of that. There are many companies that do awesome projects like that; ESL (eSports League) and Riot Games are two examples. I wouldn't find working for myself or start up companies like Counter-Logic Gaming (CLG) or Team Solo Mid (TSM). 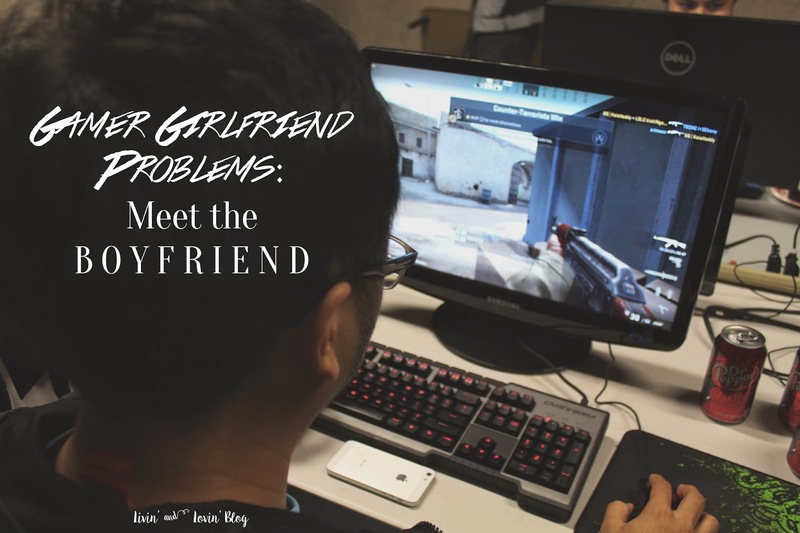 And since this series is called "Gamer Girlfriend Probs," gaming has obviously had an impact on my relationship with Kriselle. Gaming, like anything, has it's pros/cons on relationships. If the two don't share the love for gaming then it's mostly cons, but Kriselle has been stepping it up to see my side of the spectrum lately which I appreciate. Sometimes it's good that we don't share common interests so that I can show her what I love and explain a multitude of things that may not make sense at all for her. And the last thing that I want to say for anyone who might be in a similar situation as ours (especially if you don't game but your boyfriend does): My number one tip is, BE OPEN. Okay having a gamer bf may be annoying sometimes but there is A LOT to learn about gaming and A LOT of potential in this industry. The video game industry makes more money than Hollywood and the music industry combined. There are tons of things to do with video games, whether it's playing the video games themselves, going to conventions (PAX, E3, etc). eSports events (Riot LCS, The Internationals), LAN parties, viewing parties at bars, arenas, even Buffalo Wild Wings etc. There's always something buzzin' if you keep your eyes and ears open. Another tip is TRY. Just pick up a game and play, if you don't like what you're playing then try something else. Like movies there's seriously a game for everyone. I hope that you were able to learn something, anything about gaming and I hope that if you read Kriselle's blog a lot that now you have a better understanding of who I am and why I really love what I do. Like I said she is starting to get interested in it which I appreciate from her and I'm also not just being lazy and ignoring her (as much as I used to, hehe) for the game like when we were younger. Gaming may seem like a phase for some, but if the guy in your life is anything like me, that might not be the case. So just be open and check out video games, you never know you just might like it! I'm more of a handheld gamer myself (3DS games like Zelda or Pokemon or Bravely Default) and my boyfriend is a PS4 / computer gamer. I mean, sometimes he plays LoL all day and it can bother me....especially right now when we are in the midst of moving and I'm trying to find apartments/townhouses while he plays games....but other than that, I normally don't mind it haha, considering I normally watch anime instead of doing work!